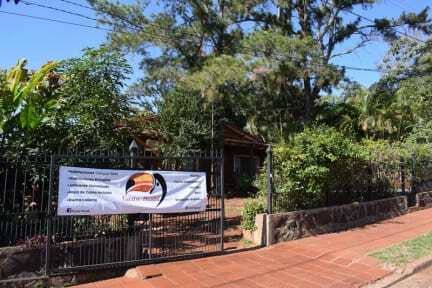 Tucán Hostel it is all about family hospitality, it is attended and managed by a local family. We expect to make the tourist feel at home and as our special guest. We offer services such as a shared kitchen (with all its utensils), pool, free Wi-Fi, bathroom, bed sheets and towels included. If you choose to have your stay at our hostel we guarantee you will have an unforgettable experience. 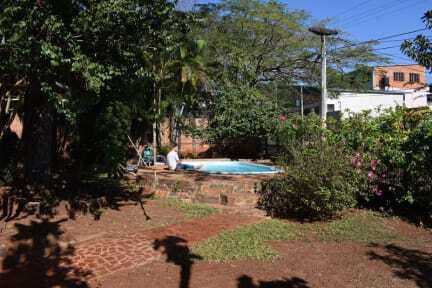 We are located in a quiet and safe neighborhood, within the heart of the Puerto Iguazu City (close to several shops and services like banks, bus station, supermarkets, exchange bureau, and bars or restaurants). We offer you different rooms with all the services that a tourist might request, as we said we do our best to make the guest feel comfortable and pleased with our facilities (see air conditioning, housekeeping service, etc.) we also advise our guests about the different tourist spots and attractions. The reception is open from 8:00 to 23:00. Mijn fijnste ervaring tot nu toe in een hostel. Het hostel wordt gerund door moeder en dochter en geeft echt een familiegevoel! Mis je thuis of je familie? Ga dan vooral hierheen voor even een warm familiegevoel in je reis! Mis je thuis niet? Dan is dit ook een zeer geschikt hostel, het is zeer schoon en ligt op een goede locatie: 5 minuten van busstation! Zwembad ook prima. Moeder en dochter zijn zeer behulpzaam, hebben mij erg fijn geholpen met een probleem. Top ervaring! I had the most wonderful stay at this hostel! Maru and her family were most welcoming and really made you feel at home. Her kids are wonderful ❤️ The facilities are also very good and clean and there was a good atmosphere. Thank you for everything! Tucan hostel is amazing! The family welcomes you with open arms and the athmosphere is really charming. Rooms and bathrooms are clean. Highly recommended. We had an awesome stay at Tucan Hostel. It’s not like the other hostels. The family who owns the place takes you in like one of their own. So, you don’t feel like a guest, you’re more like a niece of nephew. They’re so warm and wonderful. The hostel is small. Therefore you won’t become a number. It’s a lovely place. Very nice family! They provide you with a lot of information About the falls and Are really friendly. Nice hostel with friendly owners and easy to meet people. Close to bus and city centre but still in a quiet surrounding. Wifi was very poor signal and there is a swimming pool that could have been awesome after warm day but did not look clean. Good kitchen and common area, bedroom clean and showers nice and warm.